﻿Walls, physical or otherwise, are seen as a protection from external forces that might cause harm. Think of a firewall - it’s there to stop potentially harmful viruses attack your computer. The Great Wall of China was built to protect the Chinese Empire from Mongolian invaders. According to Trump, his wall is so important to the USA, he’s threatening to declare a national state of emergency. 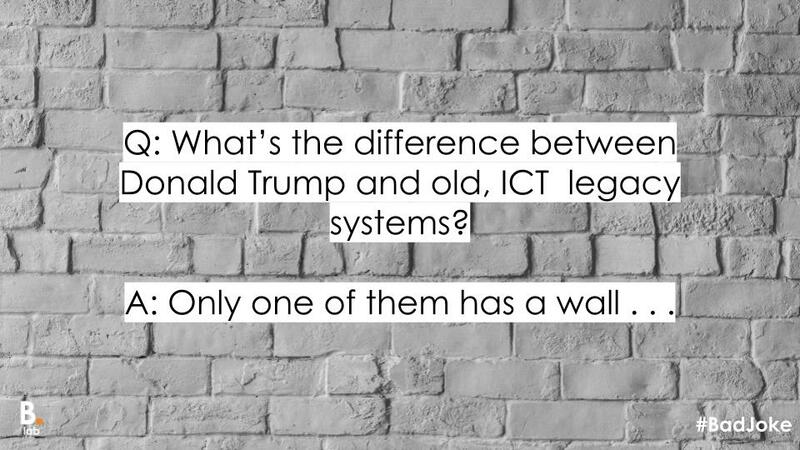 But, before you think I’ve lost my mind, there’s a reason why I’m talking about walls - we’ve been building them within our organisations without even knowing it. We deal with a lot of start up organisations here in the Lab - we love the enthusiasm they bring as well as their unique way of looking at the world and designing solutions to fill a gap in the market. It’s probably because they work on similar principles - small team, think fast, prototype quick, test small. I’ve been catching up with some of our contacts in the last week or so. One of the startups was telling me that whilst people were loving their product and wanted to work with them, they hit a blocker when it came to integrating with legacy systems. During initial conversations, a legacy provider told their client that they could integrate, but when it came to the crunch, that came at a cost. In nearly every case, legacy systems have been tailored so much, that any changes to the API’s, file structure or pathways, no matter how small, will ensue a cost. A big cost. This doesn’t surprise me. Having project managed procurement processes for new systems, existing system integration and data quality are the two top issues that you absolutely need to nail. ﻿If you look back through history, it’s not often any good comes from building a wall. Stopping the flow of people, ideas and cultures means you end up in a weird bubble of self propagation, believing your own hype. You build an infrastructure around what you already have and largely on the basis of what you think is right, because you aren’t open to external stimuli that might just spark a different train of thought. You don’t know any different. You’re happy for people to work with you, but it’s going to cost them - with countries it’s through tariffs, with systems it’s through expensive consultants. That has to change. 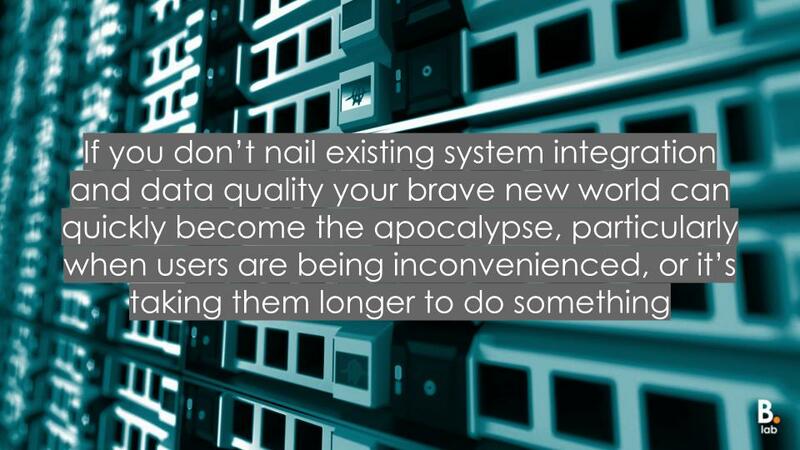 As Neil Tamplin writes - this is one of the key markers for ‘digital transformation’. The demarcation between old closed hierarchical organisations (we know what’s good for you) versus new open networked organisations (we want to know what’s good for you). Technology has moved on significantly in the last few years alone, with the pace of change ever increasing, so to make the most of the exciting new products and platforms that are out there, we need to start making ourselves more open to integration. It’s something I’m really excited about here at Bromford - our move to a Microsoft Dynamics 365 platform will give us a gateway to potentially revolutionising our services where an opportunity presents itself, mainly by making the integration process as simple as a yes or no answer. Legacy providers - Take heed of what is going on in external environments and adapt, otherwise, you could soon find your customers leaving you for greener pastures. I remember having a conversation with a well know housing systems provider a few years ago in which they scoffed in my face when I asked whether they offered a cloud based solution - apparently it would never take off. Organisations - Challenge back. I’d be happy to stand by this statement - 99% of what you want to do can be done. There are many amazing entrepreneurs and businesses out there that are already doing this stuff, so reach out!